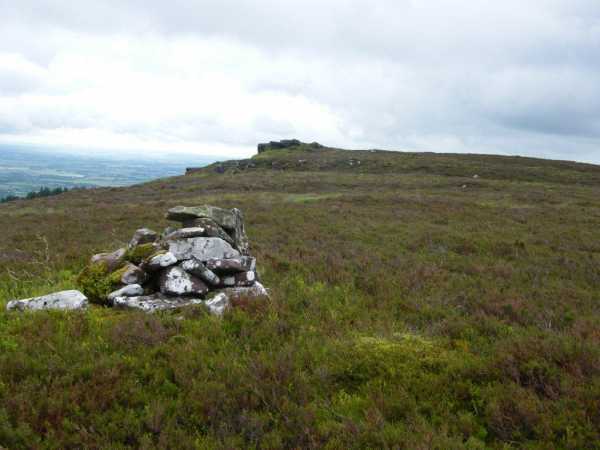 Picture from group : Coolfree cairn and rocky outcrop. Picture: Coolfree cairn and rocky outcrop. Good views. Ensure you read the directions for easy access. Park at forest entrance R665 168 A. Follow the forest road, take first left which brings you round to the east of hill. Follow track downhill to a steeply rising forest track at R6753 1643 B. forest ride on right which leads up through forest to bottom of heathery summit. Work your way up on the tracks and you can get to within about 140m of the top. Round trip around 80 minutes. Park at the forest entrance at R66296 15968 C , room for 5 cars. The first section is on a track then cross directly uphill through 600 meters of rough forestry planting.